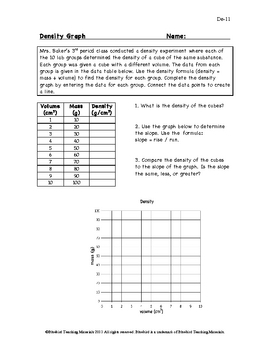 In this worksheet, students are given the lab results from a class density experiment. Ten different sized cubes of the same substance are measured for mass and volume. 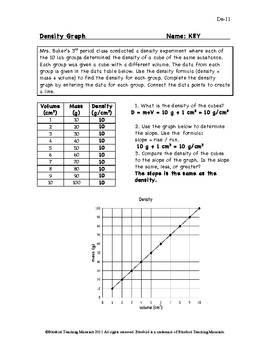 Students determine the density for each cube and then record the results on the density graph. They then answer three questions about the information. This worksheet includes a full size answer key. (Bluebird Teaching Materials) This listing is similar to my De-9 listing.